Hardwood charcoal is the best choice next to Olive Pit Charcoal, do not use any BBQ briquettes, especially ones smell and smoke a lot. I use Whole Foods s 365 brand hardwood charcoal. For choice of charcoals please check the following website: http://www.nakedwhiz.com/lump.htm (Place small pieces of hardwood charcoal on stove stop to burn for a few minutes till they are red on the side, then transfer to clay stove. 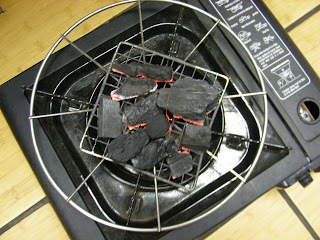 Add more charcoals if necessary during the session. See picture. Fan from the bottom opening of the clay stove will speed up the fire. To put out fire completely, cover lid with the knob on, and cover the bottom opening. You may stop the fire at any time this way without waiting for the fire to burn out or put water over it and make a mess. 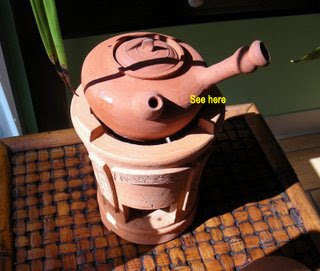 If you want to stop making tea for a little while, but want the fire going for later, cover lid with the knob off, cover the bottom opening but leave a small gap on one side to keep the air flowing inside the stove chamber. This way the charcoal will keep on going at low temperature, when you are ready to boil water again, open up the cover and lid, add new charcoal to catch on fire. You can adjust the bottom cover to control fire temperature as well. Bigger the gap, more oxygen, higher the fire temperature, faster the water will boil.